I’ve been playing some tabletop ACKS sessions with my kids, and since I’m also on a house-ruling kick lately, there’s one issue with ACKS that I want to deal with. A while back I started using Beragon’s house rule for Thievery Skills. It’s fairly straightforward – in most instances you get a bonus to the dice throw, making it easier to succeed. It also has the benefit of preserving the Thievery chart from the ACKS Core Rules. However, this opens up the slippery slope of variable “target numbers” on checks. In ACKS, most probabilities are intrinsic to the character, not tied to a “difficulty class” or “challenge rating” of the task itself. Especially when I’m playing with kids, I’d like them to see how an entry on their character sheet – say, Move Silently (13+) – translates into a dice throw. If I’m adding a bunch of modifiers “behind the screen”, it takes agency away from the players and makes it harder for them to understand the system. 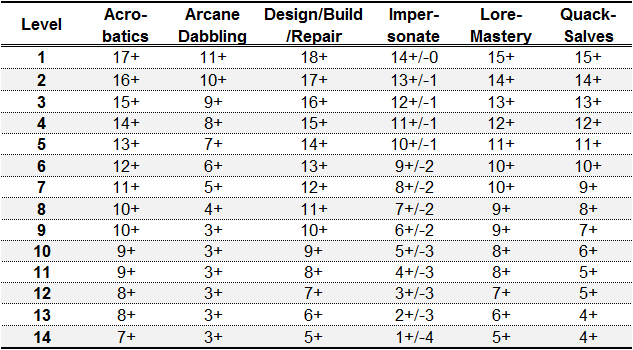 So in the end I’ve decided to change the Thievery Skills table (ACKS Core Rules p.23). I’ve bumped most of them up by 4 (a 20% improvement) at 1st-lvl, then smoothed the progressions somewhat so they eventually match the RAW. I’ve left Climb Walls alone and adjusted Hear Noise by only 2 points because these skills already had better odds. I’ve gone through my various custom classes and updated the Basic Builder to reflect this new house rule. My home campaign continues to diverge from the ACKS baseline. This entry was posted in House Rules and tagged ACKS, RPG, Thief, Thievery. Bookmark the permalink. Thieves of 4th and lower levels may perform hijinks only as part of a guild. Thieves gain, at 5th level, the ability to perform hijinks independently. At 9th level, a Thief’s hirelings of 1st through 4th level can perform hijinks. What about just 11+ for all Thief skills (except climb and Hear Noise), modified +/-1 per level difference at all levels?